Why Buy Our Ambi-Catch Release? Home > Why Buy Our Release? 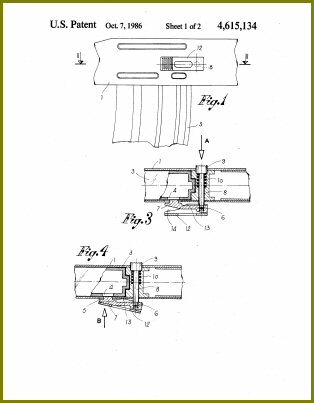 A great deal of thought went into the design of our release, resulting in the award of a patent (US PAT 5,519,954). Several ambidextrous magazine release designs existed at the time of issuance and our design was unique enough to qualify for a patent. 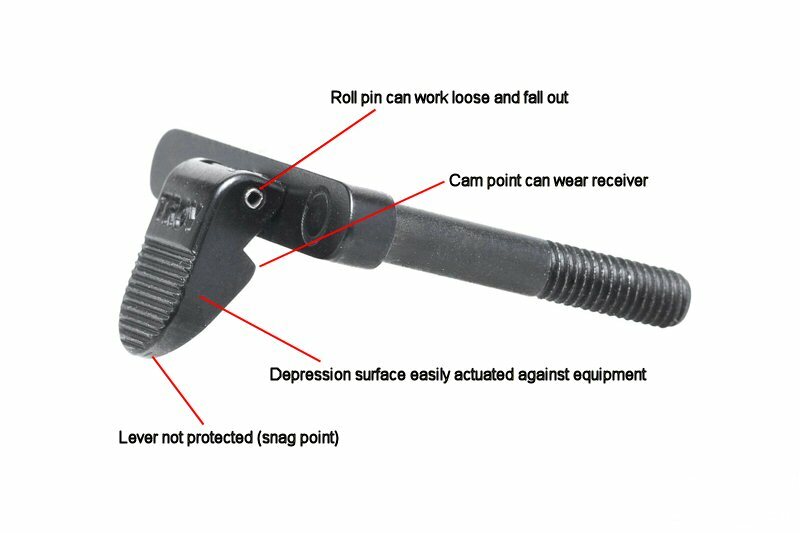 One device for the Beretta AR70/90, utilized what we refer to as a "cam-off" lever attached to the magazine catch which, when depressed, "cams-off" the receiver pulling the magazine catch away from the magazine. The original "cam-off" ambidextrous magazine catch of the Beretta SC70/90. Steel lever camming against a steel receiver (note the addition of a protective fence to protect against inadvertent release/snagging). The disadvantages of this design include the assembly being prone to inadvertent release, creation of a "snag point" on the weapon and failure of the "cam" lever if something becomes lodged behind the "cam" lever (twig, ice or small stone). Another disadvantage of the "cam-off" design is the lever will wear the anodized finish at the pivot points under the "cam" lever. Virtually all of the currently available "drop-in" ambidextrous releases, except the Ambi-Catch™, employ this type of "cam-off" design. The Ambi-Catch™ is "self contained" and "cams" on itself. The assembly is nested in the lower receiver protecting it from ice, sand and debris. 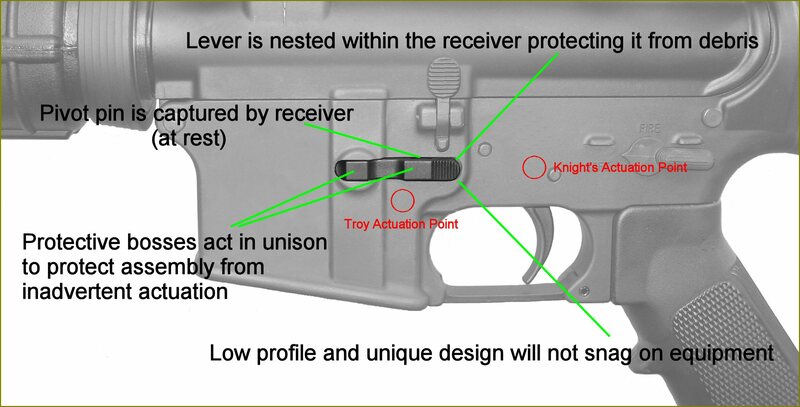 The low profile of our release does not create a "snag point" and the assembly is actually protected by the lower receiver of the weapon. The location of the depression surface of the lever is in the same location as the primary magazine release button on the opposite side of the weapon. Depending upon the configuration of the "cam-off" device, you will either need a shorter finger (Knight's release) or longer finger (Troy release) in order to comfortably reach and depress the "cam" lever with your trigger finger. The low profile of the Ambi-Catch™ makes it virtually impossible to break from an impact to the lever. 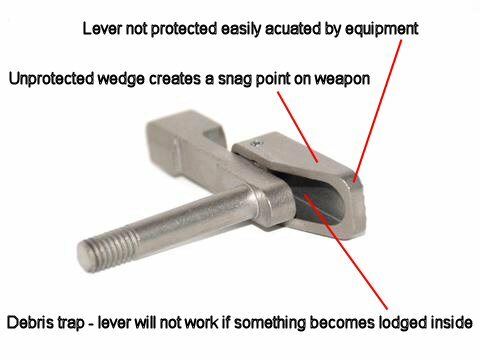 Breakage of the lever from impact (and normal function) has been reported from some users of the Troy release. 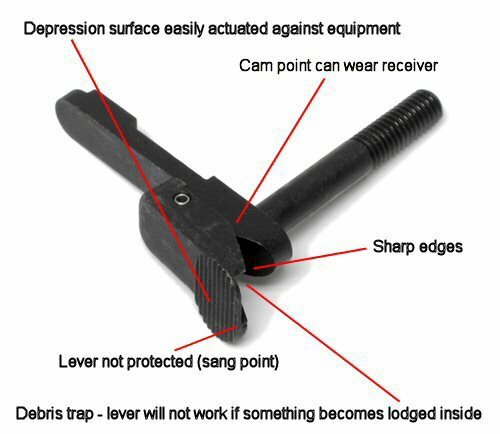 The lever of the Ambi-Catch™ is designed to require more force to depress with a loaded magazine installed in the weapon (bolt carrier forward). This characteristic combined with the addition of protective bosses and increased tooth engagement combine to protect the assembly from inadvertent actuation. The protective bosses are designed to impact equipment simultaneously on the same plane as the serrated depression surface mitigating inadvertent activation of the assembly. 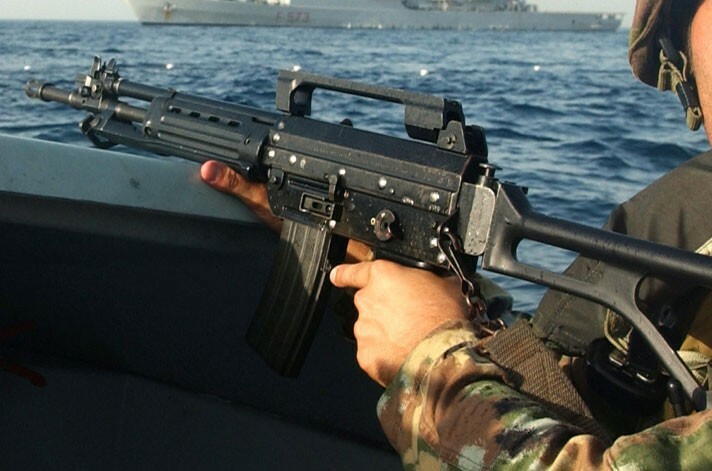 The Ambi-Catch™ is the only drop-in ambidextrous magazine release to have been extensively tested by Naval Surface Warfare Center, Crane for the USMC and the only currently available release to have a National Stock Number (NSN) 1005-01-537-6498. The United States Marine Corps approved the Ambi-Catch™ for use in all M16 rifles and M4 carbines on 31 Aug 2007 (MI 05538D/10012A-OR/1A). The USMC has trained with and used our ambidextrous magazine release in a complete range of tactical environments and actual combat. Other countries using the Ambi-Catch™ are Canada (C7A2 and C8A3), Norway (C8SFW), Denmark (GV M/10), Netherlands (LOAWNLD) and the United Kingdom (L119A2). Law enforcement agencies should note the Federal Bureau of Investigation (FBI), in November of 1999, tested and authorized the Ambi-Catch™ for use in all personally owned and Bureau M16s, AR-15s and M4 Carbines. After 20 years, the Ambi-Catch™ is still the best "Drop-in" ambidextrous magazine release for the M16 Family of Weapons (including the M4 Carbine) and AR-15 type weapons. You deserve the best, purchase a Norgon Ambi-Catch™ for your favorite AR rifle or carbine.